5 pcs. 1,30 EUR ea. from 15 pcs. 1,14 EUR ea. from 40 pcs. 1,02 EUR ea. from 80 pcs. 0,95 EUR ea. Ask for a rebate from 550 pcs. A good in-between size! This disc magnet might be small, but it is nevertheless impressively strong. It can hold 35 sheets of A4 paper on a metal cabinet. Two of these magnets will still attract each other through 30 mm of wood. In 2006 our company founder said: "If this one is not going to be a big hit, I'll go get another job." And he was right after all: We have sold more than 3 million of those discs! 1 pc. 2,65 EUR ea. 1 pc. 3,31 EUR ea. 1 pc. 4,41 EUR ea. 5 pcs. 1,91 EUR ea. 1 pc. 5,17 EUR ea. 5 pcs. 0,34 EUR ea. 5 pcs. 0,86 EUR ea. 5 pcs. 0,98 EUR ea. 5 pcs. 1,26 EUR ea. 1 pc. 6,16 EUR ea. 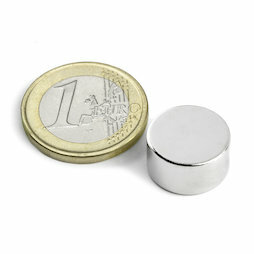 Ø 15 mm, as a counterpart to magnets, not a magnet! Attach a pile of 35 sheets of paper to the wall? No problem with this disc magnet! Two of these strong disc magnets attract each other all the way through a forearm. This disc magnet is especially suitable for making your own magnetic knife racks - or to hang up cardboard on magnetic glass boards. Adhesive force in relation to the air gap between magnet and steel plate. Our customer, "Hänk", sent us this picture. He comments rightly: "No imprudent, hectic movements when handing these magnets - otherwise you end up with something like in this photo." Welcome to the club, Hänk! Our customer application shows how to thread a needle with this magnet. Here a test with a S-15-08-N: The adhesive force perpendicular to the surface is 6,7 kg. The adhesive force in shear direction is only 1,45 kg. With a self-adhesive silicone disc between magnet and steel plate (practically invisible because it is black and only 0,5 mm thin) the disc magnet can hold over 3 kg in shear direction; then it starts to slide down. How does magnetic data storage work?